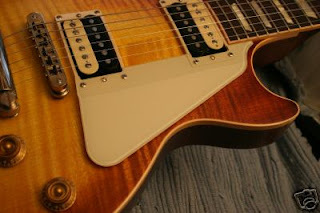 Gibson currently sells some of their Les Paul models without the pickguard installed -- probably as a cost-saving measure. The pickguard, screws and mounting bracket are placed in the case's accessory compartment and left to the customer to install themselves. One can only imagine the number of little disasters this has caused. Bobby Lee, who works in plastic fabrication, has come up with a solution for the Les Paul owner who doesn't want to drill holes into his guitar. To attach the screwless pickguard, the user has only to remove the two pairs of pickup mounting screws on the 'pickguard side' of the guitar. The four holes on the screwless pickguard are then aligned with the holes on the mounting rings and the mounting screws replaced. A small silicon rubber grommet is attached to the underside of the pickguard which contacts with the guitar's top for added stability. Although according to Lee, only one of his customers has installed the grommet since the system is already very secure and solid without it. And voila -- the pickguard is now attached without having to drill a single hole into the instrument. And the guitar is easily restored to factory spec by simply removing the pickguard. The screwless pickguard is a great quick-fix solution for Les Paul players who rest their pick hand fingers on the guitar, inadvertently leaving a swirl of tiny scratches in the finish. The pickguards are available in left-handed models and in a variety of colors -- cream, black, 'Robot' blue and clear (is that a color?) so that the full grain of that figured top is in complete view. 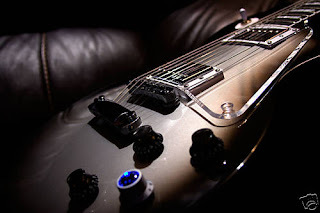 Lee's pickguards, recognized by Gibson as a qualified after-market accessory, fit Les Paul Standards, Studios and Classics as well as the Epiphone series of Les Pauls. As of this writing Lee's pickguards are being developed for the Historic-series Les Pauls.